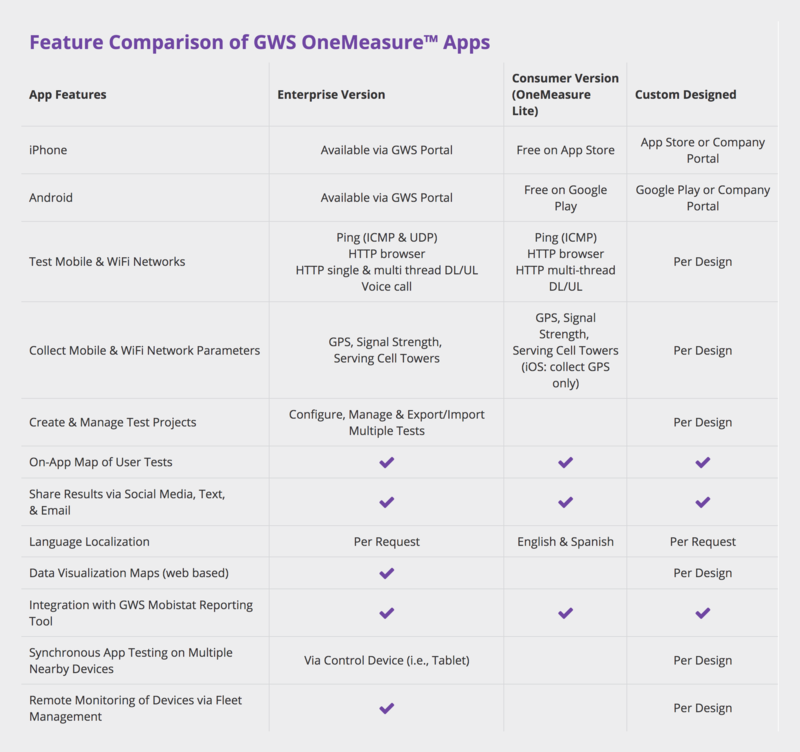 GWS' benchmarking products include the OneMeasure app platform, a suite of mobile diagnostic apps that provide easy-to-use, network testing capabilities for the wireless industry including network operators, mobile device vendors, regulators, and consumers. The enterprise version is built to quickly yet thoroughly test mobile and Wi-Fi networks in terms of data speed, network latency, signal strength, serving cell towers, GPS and other key performance indicators. Independently, the app provides cost-effective, surface-layer performance analysis, and when combined with GWS' industry leading testing solutions, it can serve to significantly enhance benchmarking efforts. Users can easily configure, run, and review multiple test scenarios involving ping, HTTP upload, HTTP download, browser, HTTP multi-thread upload, and HTTP multi-thread download. Users also have the ability to configure test controls including count, duration, or continuous testing. In addition, test configurations created for a current project can be saved for future use. Results from a test project are instantaneous and can be shared with others. The results can be viewed in various levels of detail from individual test results to a project summary. And users can also view the trends resulting from conducting multiple tests. When combined with Mobistat™, GWS' advanced post processing technology, enterprise users can also view app test results via a secure website, and have access to interactive web-based reporting and mapping tools. Thus, adding another layer of evaluation for the performance measurements generated by the app. GWS can custom design a mobile diagnostic app for your company. 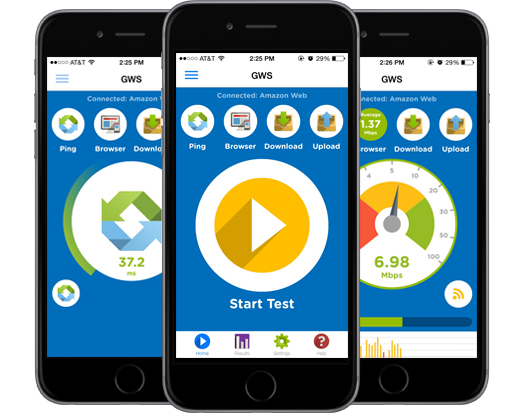 Based on the OneMeasure mobile platform and engine created for GWS' network testing activities, GWS can provide a network diagnostic app for your brand and for your testing purposes. Testing can be custom designed to include network latency measurements and upload and download network stress tests. And similar to GWS' OneMeasure enterprise and consumer versions, the app can be designed to allow users to share the results of their tests with others via social media and email.